The board painter has been updated : you can now choose the start value for rows. This configuration parameter is saved when using "Save" button. Default is 1, you can now change it but if you want to start with 0 you can use this URL http://musketeerchess.net/tools/boardpainter/?s=0 and bookmark it. Does that suit the need? Excellent work! Namera looks good too. I got another issue, the color of A1 square should be dark, to accomplish this I need to start the row number at -1, but this would create an extra row = -1 that is not needed, see image below. Perhaps there is an option too to change the color of left bottom corner square. In case for musketeer, the A0 square should be set to a white or light square so that the A1 square would become dark. Could you tell me how you have the display connected. Are you using our Cable for the NHDev Development Board, and what display you are selecting on the NHDev Development Board. I don't really understand what u r talking about. 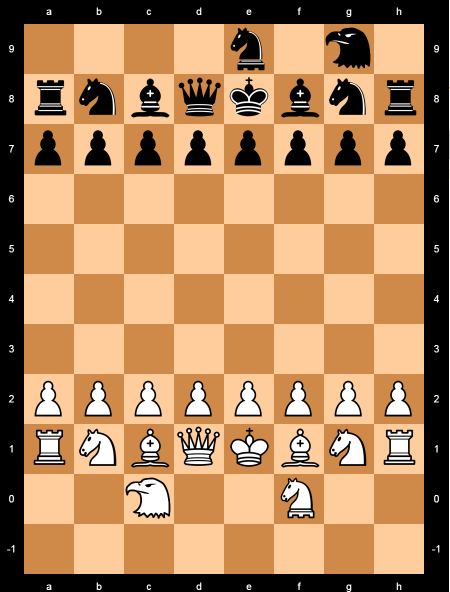 This is not a "Physical" Chess Board, but an online tool allowing to configure Boards for Chess Variants with classic boards composed of x number of lines and y number of columns.